The Cincinnati area has a legacy from the ice ages of very steep hillsides cut into soft rocks. Our landscape is in the process of adjusting by weathering, sliding, and erosion. This adjustment, often accelerated by human activities, poses a special challenge for real estate developers and for those financing development, but at the same time opening opportunities for obtaining properties with wonderful views that can be stabilized at modest cost. Used in its engineering sense, the word “failure” refers to an undesired response in a material, in our case soil or rock on a hillside. Failure in a material can take the form of a clear break in rock of soil (a rupture), involve deformation of the soil (plastic behavior), flow of the soil (liquefaction), or combinations of these behaviors. The rates of movement that result cover an enormous range, from imperceptible to faster than you can run. Informally, all rupture-style failures are referred to as “slides” or “slips,” but it is important to distinguish among different failure types if we are to avoid or to safely fix them. 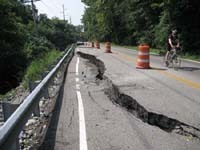 Failures seen on Cincinnati hillsides are of six main types. From slowest to fastest these are creep, rotational slides, stream bank failures, translational slides, debris flows and rock falls. Collectively, these processes belong to a larger class of mass wasting, because rather than grain by grain transport such as sand in a stream, entire masses of unconsolidated material move down slope powered by gravity. To these we add expansive soils, which can cause problems even in flat areas. Creep – the slow persistent downslope movement of the soil mantle is persuasive on hillsides. It is generally so slow as to be imperceptible, but in some cases can be much more rapid. Creep is the cause of tilted walls, poles, fences and, as a lateral pressure, also of cracks in walls and breaks in underground piping, especially where it parallels the hillside. Rotational landslides – rotational slides have a curved slip surface. The slide mass stays largely intact, rotating backwards as a unit. Slides of this type are best developed in thick unconsolidated materials, and the failure surface can be very deep, 50 feet or more. Translational landslides —translational slides have a planar slip surface, generally striated. They are typically thin, 2-4 feet, and have a failure surface at the contact of bedrock with overlying soil. The slide mass is highly deformed. Stream bank failures — These slides often occur where erosion of the bank is accelerated in a stream bend. Failure can be nearly vertical or take the form of a steeply dipping rotational slide. Stream bank failures away from bends may also occur after flood levels decrease rapidly.